Ruth Wanner could not be happier with her decision to move to Fairmount. Although she had her name on the wait list, she did not think she would get a call as soon as she did. She is younger than most people living in retirement homes, and still works her job as an operating room nurse at the hospital where she has worked for 40 years. Her home of 34 years was on the end of a nice quiet dead-end street. She hadn’t anticipated leaving it at this stage of live, and wondered if living in a community with other people so close would feel overwhelming. However, when she got the call in March that there were two cottages available, she decided there was no harm in looking. And one of the cottages proved to be everything she wanted and more, including a beautiful sun room on the south side of campus overlooking miles of farmland! “I liked the cottage so much that I was afraid I might not find another one I liked as much,” Ruth shares. Ruth grew up in Churchtown, and later moved to the Plowville area where she and her husband lived for 29 years until his passing five years ago. Many friends and relatives, including her mother, all live close by, and she has made many more friends at Fairmount as well. She is already finding new activities to enjoy with her new friends, while continuing to pursue her hobbies of many years: counted cross stitching, reading, and traveling with friends. 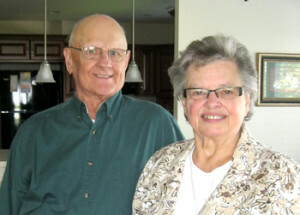 Paul and Elsie Beiler moved to a new Fairmount cottage in December of 2016 from Nickel Mines, Pennsylvania, where they had lived since 1962. There Paul ran his own crop spraying business. Elsie felt she was fortunate to work at home and help Paul in the office while they raised their five children. As Elsie neared 60 years of age, her passion for painting became a major part of their lives, especially after producing a series of five Nickel Mines paintings that touched on the tragedy that unfolded there. Her paintings were displayed and sold at a local gallery. After Paul retired from crop spraying in 2004, he started a taxi service and also helped with the business side of Elsie’s artistic endeavors. When the time came to plan for retirement, Paul and Elsie attended several open houses at retirement homes. However, Fairmount was their first choice. It was a familiar place; several relatives had lived here and Elsie’s parents both spent time in Fairmount’s rehab. They appreciated the excellent care their family had received. As they contemplated a move, their children were very encouraging. They all felt it was a good idea to get where you want to be while you are both healthy enough to help each other with the move. 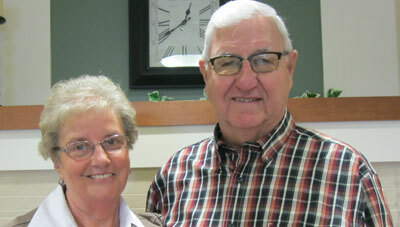 Paul and Elsie have been very happy with life at Fairmount. Not only have they made friends with their neighbors, but they have remained active in their church, although it is 18 miles away. Their cottage has plenty of space to entertain friends and family. Elsie continues to paint, and they are grateful for a two-car garage, part of which serves as needed storage space for finished artwork and supplies. Paul continues to help with the business end of the art venture. Moving to a retirement community usually involves some downsizing. However Jim and Esther Hodgkins actually expanded their living space this fall when they moved into their 1,464 square-foot, two-bedroom, two-bath Fairmount cottage. After a decade of “full-timing” in their 38-foot recreational vehicle, they once again have a permanent place to call home. Over their married life, the Hodgkins visited all 50 states (not always in their RV) as well as many countries. As “full timers” in their motor home for the past 10 years, they have been moving from one place to another every three or four weeks, except for winters which they spent in Mission, Texas. Jim and Esther both enjoyed fulfilling careers. In 1958 Esther earned her LPN license and Jim fulfilled his dream of securing his 1st class operator’s license to work in a radio station. Esther was a nurse for many years at Community Hospital in Reading. Jim spent his entire career as a broadcast engineer, working for the same radio station in Reading for 30 years before retiring in 1993. “It was never work for me—it was fun!” he declares. On the side, Jim had his own studio where he made vinyl records, cassettes and CDs, and in addition he ran his own photography business. In 2005, he gave up his studio to go on the road, but he still enjoys photography and carries a camera wherever they travel. Although they are still young and energetic, the Hostetters are aware that health situations crop up more frequently with age. “My doctor told me that it would be a good idea to slow down a bit. When I move here, I won’t have to mow the lawn or push the snow. When something breaks, someone else can fix it,” Don chuckles. There are plenty of other factors that appeal to the Hostetters: They will be closer to three of their five children who live in the Lancaster area. They found the prices reasonable, especially the monthly maintenance fees. And the hilltop setting is perfect for them. Coming from a farm, they love seeing the farmland spread out below. When Byron and Ann Zimmerman moved to Fairmount Homes, they settled close to their roots. Both were born and raised in Lancaster County, and moved to Leola a few years after their marriage. They started out farming, but soon decided to learn the insurance business instead. Both became insurance agents and brokers and built a business over the years that afforded them many opportunities. They especially enjoyed traveling, and went by plane, sailboat, motor boat, biking or RV, all over the world. Their travels included Switzerland, Laborador, Alaska, Spain and Morocco, to name a few. On their 60th anniversary, Byron and Ann Zimmerman decided it was time to investigate retirement homes. After researching, attending open houses, and consulting with their children, they put their names in at two places. Ann also spent time volunteering in order to learn more about Fairmount and become familiar with the environment. When the call came offering them an apartment at Fairmount, they readily accepted. Their new home has a great view to the south—overlooking the area they called home for most of their married lives. Both of them stay busy, still going in to the office at least one day a week. Byron also drives an Amish family to market in Harrisburg, leaving at 4:30 a.m. every Saturday morning, and returning around 6:30 p.m. He teaches a Sunday School class at their church, and for recreation loves to ride his bicycle on Lancaster County’s back roads. Ann learned to weave and became quite expert. Her loom is set up in their second bedroom where she creates beautiful items that she sells at craft shows or donates to Fairmount’s Benefit Auction and the Lancaster Mennonite School Silent Auction. She continues to volunteer at Fairmount, visiting with residents in Health Care who have become her friends over the years. 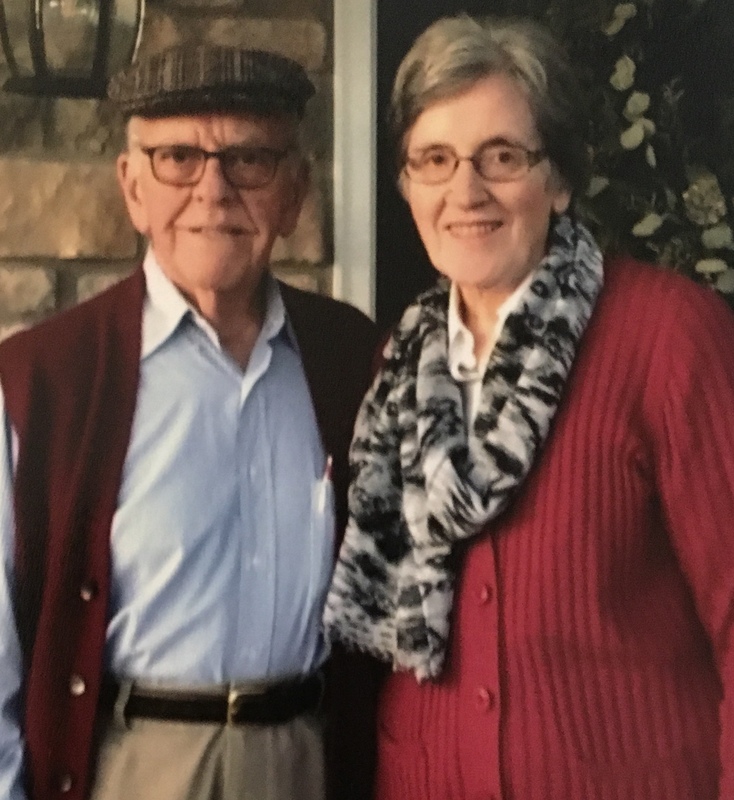 In 2014, Charlie and Joyce Martin retired and moved to Fairmount Homes—a logical choice given that Joyce’s parents had also lived here when the apartments first opened, and that they were both born and raised in the local area. Except for a year in Puerto Rico, they lived, worked, and raised their four children not too from their New Holland origins. The Martins started their married lives on a farm. After 10 years of farming, Charlie started working as a cabinet-maker, and Joyce started a bridal shop, selling bridal gowns and doing alterations. Later they became full-time youth leaders for their church. 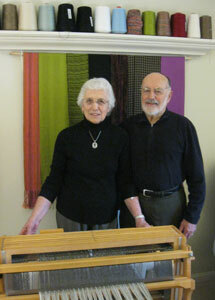 Charlie and Joyce brought a unique experience to Fairmount. 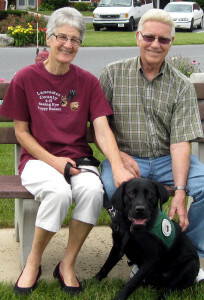 They had begun raising Seeing Eye puppies in 2002, teaching the young puppies simple commands and taking them everywhere they went for the first year of their lives to socialize them. For the Martins, the rewards were tremendous, especially when they were invited to see “their” puppies trained as service dogs that enabled blind people to live independent fulfilling lives. As they contemplated retirement, the Martins decided not to take new puppies, but to offer respite care for trainers on vacation who could not take the puppies with them. 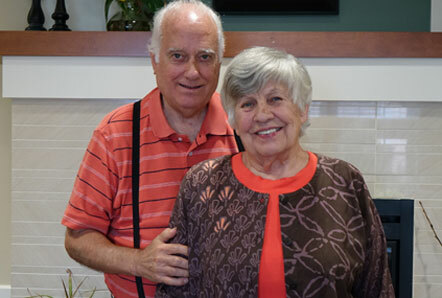 This arrangement allows Charlie and Joyce to travel freely and enjoy their retirement without being tied down. How did this fit into their new Fairmount Homes apartment living situation? They discussed the idea with Fairmount’s administrative staff, and got the go-ahead to give it a try. Since then, the sight of Joyce with a puppy in training has become a familiar one. It has worked out very well, and they are delighted to continue serving the larger community from their new home. As for Charlie, he stays busy in Fairmount’s wood shop building furniture for non-profits, including ReUzit and Fairmount. He recently constructed a beautiful shelving unit to hold all of the resident charts for one of the neighborhoods in Fairmount’s nursing area, as well as a much-needed bookshelf for Fairmount’s Country Cupboard in the Wheat Ridge lobby. Certainly they did not slow down, but simply began living their lives from a new location where, incidentally, from their living room window they can see their former home and beyond! As a young girl Martha Kauffman Weaver dreamed of becoming a teacher. That dream was delayed when she had to drop out of high school to help on the family farm. There she helped her mother cook for hired hands, picked apples, milked cows, gathered eggs, and planted a garden. Her desire to teach was fulfilled in part by teaching Bible school and Sunday school at the small mission church in which her family was involved. Then at 25 years old, she attended a July institute at Eastern Mennonite College, and her desire to go back to school was rekindled. That fall she started college at EMC and graduated four years later. 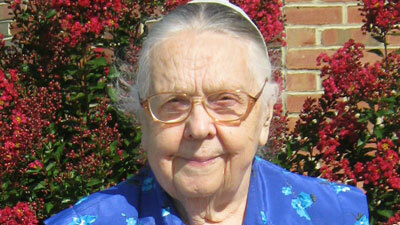 For many years she taught in Mennonite schools, and later went to Temple University where she earned a Master’s degree. For many years after she retired from teaching on a regular basis, she served as a substitute teacher. In the meantime, she was always writing. 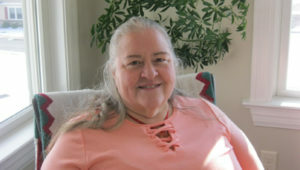 Martha’s days are occupied by writing letters to friends, creating puzzles and writing articles for church publications, or writing her next book – all on a computer. Her latest book, The Garden in My Heart, was recently published and is already on its second printing. In 2013, when Ephraim and Mabel Hernley were researching continuing care retirement communities, they read in the Perspective that one new cottage was still available. They had checked out plenty of other retirement homes, and none felt exactly right. But they decided to take a look at Fairmount. When they saw the view from that new cottage, they knew they had found their home. “I could live here!” Mabel remembers exclaiming as she stood in the kitchen overlooking miles of farmland below. The Hernleys’ primary concern was the availability of health care. A health scare had pushed them to ask, “If we need care, what will we do?” For them, the answer was to seek a continuing-care retirement home where, if needed, they could receive excellent health care. True to their word, they have found plenty to do. Prior to their move, they made a special request to bring with them some of their berry bushes, so a typical summer day finds them picking blueberries, boysenberries or blackberries from the hardy bushes back of their cottage, or strawberries in the raised bed Ephraim built behind the deck. The peppers, tomatoes, onions, potatoes and zucchini produce almost enough to get them through the winter. There are many additional outlets for the Hernleys’ varied interests. They both sing in the Fairmount Chorus and serve on the Residential Living Activity Committee. Ephraim also sings in a Fairmount men’s quartet and makes coffee for coffee hour one morning a week. Mabel helps to manage the Farm Crest Gift Shop, making good use of her many years of experience as a buyer and head cashier for a Christian bookstore. The couple could not be happier with their decision to enjoy Fairmount living. Wilmer and Gladys Martin are convinced they have the best cottage in the best location on campus. “We had our name on the waiting list, and were called many times before we came,” says Wilmer. “But when we saw the location of the new cottages being built, we were convinced the time was right. They have not regretted their decision for a minute. What do they like best about their new cottage? They appreciate so many features that choosing one is difficult. Eventually Wilmer and Gladys agree that the two-car garage tops all the other benefits of their new home. For the first time in their lives, they can just pull into their garage and unload groceries without worrying about inclement weather. And by keeping just one of the cars inside, Wilmer has room for a wood shop, where he makes shelves, corner cabinets, and podiums upon request for a local business. From their Fairmount cottage, the Martins can maintain the same active lifestyle they enjoyed in their former home. 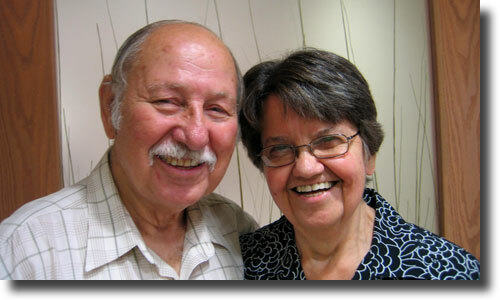 Wilmer and Gladys still work as needed at a local restaurant, and Gladys volunteers in several capacities at Fairmount. 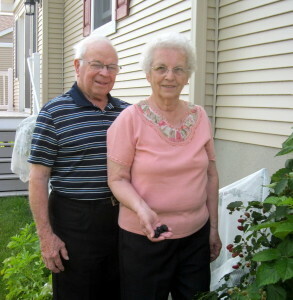 They both enjoy gardening, as evidenced by lovely flower beds in front of their cottage, and the tomato plants that produced such an abundant harvest this summer. Now they have plenty of time for everything they like to do, rather than spending time on what they need to do. John Hostetler has been a Fairmount resident for 11 years. He and his wife Kathy first moved into a cottage in 2005. Kathy passed away just a few years later, and in 2014, he downsized into a beautiful, one-bedroom Crest View apartment with a great view. John’s life is one of service, and at 91 years of age, he continues to serve. Once a week he spends an afternoon as a cashier at the Ephrata ReUzit, a local thrift store benefitting the international relief, development and peace organization, Mennonite Central Committee (MCC). On two additional afternoons each week he gets together with a friend for lunch before spending the afternoons working with Booksavers, which sells or recycles used books. 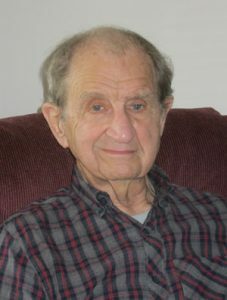 ReUzit and Booksavers are both part of MCC, the organization he has worked for since 1953, and that he helped to grow throughout his many years of service there. “MCC was the best thing that could have happened to me,” he reflects. John grew up on a farm in West Liberty, Ohio, and always assumed he would be a farmer. However, World War II and the draft took him away from the farm for two years in Civilian Public Service (CPS). After that, he spent another four years at Goshen College, where he took courses in accounting, bookkeeping, economics, and teacher education. It was great preparation for his role with MCC in Frankfurt, Germany, where his accounting and bookkeeping skills were used to organize and keep financial records up-to-date. His two-year commitment in Germany stretched into six. While in Frankfurt he met Kathy, another MCC worker from Ontario, Canada. 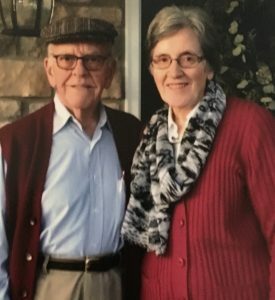 They married in Frankfurt, but in 1959, the year the first of their two sons was born, they returned to the United States and settled in Akron, PA. There he continued to work with MCC until he “semi-retired” at 66 years of age. Over the years, John was an integral part of MCC’s growth and structure. When he started working back in the United States, he first managed the collection and shipment of material resources to poor countries, becoming their exporting expert. As needs changed and MCC grew in response, John was instrumental in starting MCC’s meat canning operation, ReUzit Shops, Relief Sales, and Penny Power programs. He also worked with other relief organizations to start Heifer Project, an international effort to end hunger. John is happy to be at Fairmount. Although he has many friends elsewhere, he has made numerous friends here and still gets together often with his family and friends off-campus. And with the burdens of home maintenance taken care of by others, he is free to continue his friendships, his interests and his life of service to others. On October 23, 2010, apartment resident Elizabeth Bell married Ezra Stoltzfus of Kinzers, PA, in the Farm Crest Community Room chapel. It was the first time in Fairmount history for a resident to be married on campus. Elizabeth had first explored retirement options in 2004 shortly after the death of her first husband. Her criteria were clear. ‘I wanted to live in Lancaster County close to my siblings. I wanted to find a retirement home where I would be safe, be able to serve and become part of a community. And I wanted to keep working,’ she explains.